This wine picked up the Trophy for Wine Of The Show at the WA Boutique Wine Awards – a show I’d never heard of before now. (Turns out to be the Blackwood Valley region’s local event, and I guess any producer of a certain small size can enter). I’m not gonna say the judges messed up, but this wine must've looked a whole lot better in 2008 when it won the Trophy. The green stalkiness on display is just too much and I found my notes peppered with the word 'green' throughout. The dominant aroma was freshly cut capsicum. OK, major negative dealt with swiftly. On the plus side there’s a pulsing, driving blackcurrant thread on the nose and throughout the palate, some lovely BBQ char and tar aromas, savoury black olive. Herbal notes include bay leaf and sage, and there’s tobacco leaf and eucalypt wrapped in vanillan oak. The palate has some decent flavour weight and length, but the greenness and herbal spectrum of flavours dominate, in my view. The dense, chewy blackcurrant is attractive. I feel the structure also lets this wine down a bit – the acid is still too crunchy and seems out of kilter with the rest of the elements. I hate to say it but this was a bit of a disappointment. Further on-line research shows it never soared to the heights of the Trophy in WA, winning Bronze medals elsewhere and 89 points from Halliday. Look, it’s not a bad, bad wine. It’s just not a Trophy-winner in my book. Value: The current release is $32 so I’m assuming the 2007 vintage was around the same, or slightly less. I think that price is a little too high for this wine (2007). 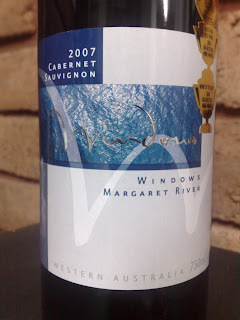 Producer: Windows Estate – www.windowsestate.com.au – Established in 1996 and now owned by the Davies family, the winery/vineyard is located at the northern end of Margaret River (near Yallingup). Site: Gravelly and sandy soils over a clay base. The website declares the property as dry-grown. Vintage: A mild winter leading into a warm and early vintage, finishing hot. A much-heralded vintage in Margs with many wines achieving great show success around the world, especially for cabernet.